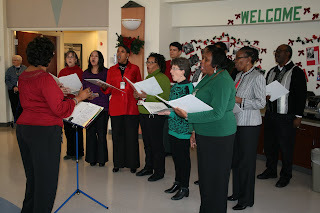 There are many longstanding holiday traditions at St. Mary’s Home, and one of the favorites has come to be the annual visit by the singing group of the U.S. Army Corps of Engineers’ Norfolk District. District employees donated gifts to the nearly 90 children and young adults of the Home through the district’s Angel Tree event. The district’s singing group then delivered the gifts to the Home on Thursday, Dec. 17, and also sang holiday songs to the children and staff. “Christmas isn’t Christmas until they come here,” Shirley Parham, a member of St. Mary’s activities staff, said as she introduced the singers. 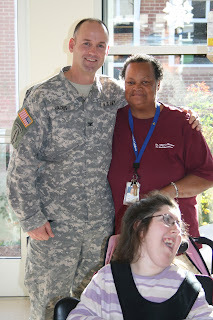 District commander Col. Andrew Backus with Shirley Parham of St. Mary’s activities staff and Aly. 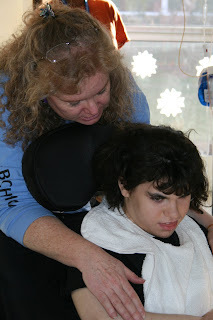 The performance delighted and touched both the children and staff of the Home. 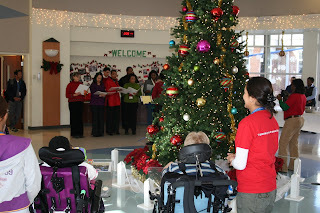 This entry was posted in Army Corps, Christmas, Shirley Parham, Stevie Wonder by marcomm. Bookmark the permalink.